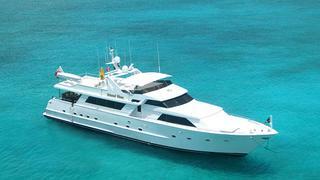 Yachtzoo sends in news of a $30,000 price cut on the 32 metre raised pilothouse motor yacht Island Time. Built in aluminium by US superyacht yard Broward Marine, Island Time was delivered in 1990. A thorough refit in 2007 saw her flybridge completely restyled and it now features a relaxation area, wet bar, Jacuzzi and a Bimini top. Another excellent area for al fresco entertaining is her large covered aft deck. Island Time is MCA compliant, accommodating seven guests in a master suite, VIP stateroom and a twin cabin with a Pullman berth. All staterooms have en suite bathroom facilities. Twin 1,080hp Detroit Diesel engines give her a cruising speed of 16 knots and a range of 3,000 nautical miles at 10 knots. Lying in Fort Lauderdale, Florida, Island Time is down from $1,525,000 to $1,495,000.